Improving the way we travel in and around Hereford is important to reduce journey times, cut pollution, create a safer environment for all road users and make the city a better place to live, work, study and visit. 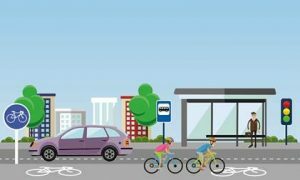 Proposals set out in the Hereford Transport Package include the Hereford bypass and associated improvements to walking, cycling, bus and public spaces, which are designed to make it easier to move about the city and give people more choice about how they travel. During a public consultation in February and March 2018, 87% of people who responded said they approved of the walking, cycling, bus and public space improvements proposed. Since then, work has been taking place to develop these further. There will be the opportunity to provide comments on the proposals during a six-week consultation being launched on Tuesday 29 January and running until Monday 11 March 2019. The consultation is asking people for their views on a series of proposed walking and cycling route improvements, including new cycle lanes, changes to junctions and crossings and new footways. It also aims to learn more about what would encourage people to walk, cycle or take a bus more often for short distance journeys. The proposals will be on public display, Tuesday 29 – Thursday 31 January, 11am-8pm at the Left Bank (Bridge St, Hereford), when there is an opportunity to speak with the project team and ask questions. The proposals will also be available at a manned display, Monday 4 – Thursday 7 February, 10am-6pm at the Old Market kiosk, Hereford. The exhibition will then be on public view (unstaffed) at Hereford Library, Tuesday 12 February – Saturday 9 March 2019 during library opening hours. To view and complete the consultation online, from 29 January 2019, please see the Herefordshire Council website at: www.herefordshire.gov.uk/HTP. “Creating an environment in Hereford where people want to live and work, where businesses can grow and communities can thrive, continues to be our overarching aim for our city. “In early 2018, we asked people to let us know what they thought of proposals for the bypass and active travel improvements across the city. The consultation feedback highlighted considerable public support for measures that encourage and support more people to walk or cycle in the city. Work is currently underway to develop detailed proposals for the Hereford bypass. More information will be available later in 2019, when there will be a statutory public consultation. « Remember, remember; the 5th and 6th of February is the Courtyard Film night!